These are the dog days of summer–long and extreme. Not the kindest summer, either. My extended horse family has suffered some huge, sad losses and a few chronic health issues have flared up in my own barn. It’s a bumper year for hurtful drama, flies, and humidity; something we try to avoid here in Colorado. To tell the truth, it just hasn’t been a giggling, tap dancing, high-spirited season. The thing about stress is that it doesn’t matter if it’s good stress, like my book, Stable Relation, coming out, or bad stress like doing without the pasture turnout while repairing flood damaged fences. Stress is a slow motion weight at mid-afternoon that makes your shoes heavy and your brain thick. It’s like a sticky winter quilt in August, but we still need the rest. 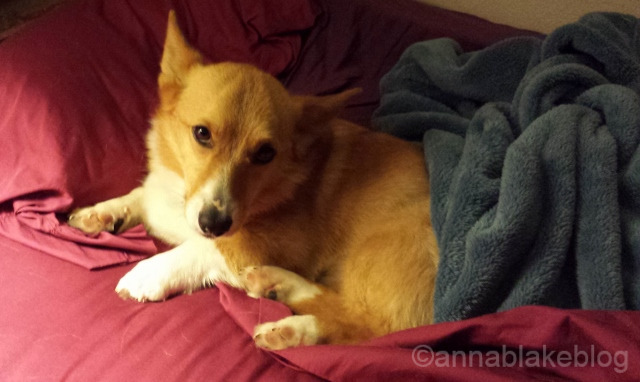 Readers tell me it’s time for the seasonal corgi report. Enough small talk of world issues, horse training, and human angst; time to focus on shorter legs and louder voices. Walter and Preacher Man are having a summer, too. The water in the bowl has no ice. The duck work is endless; the way they speed-waddle after flies needs to be watched constantly. And then the bunny population has exploded; there’s a farm-wide illegal immigration problem that must be addressed. Job related stress has never been higher, but the little men are Corgi Tough. Walter is much too busy to whine about his terminal diagnosis(here), but his anxiety seeps out. He’s anxious about meals–all five of them every day. He’s anxious about feeling weaker–so he’s trying to act stronger, like a tiny man who needs to let the world know how crucial he is to world order. We tell him we know, but he’s still working double shifts. Walter has an existential dilemma: is he is living a lie? This is a dog ailment that goats and politicians never experience. It kept Walter awake, bounding to the back door with an ear-splitting caterwaul every hour or two, night after night. Finally, I closed the door to the crate Walter sleeps in. We should all lay down our daily worries as easily. His snoring tells me it’s possible. Then Preacher Man, who was sleeping under the bed like a snapping turtle under a riverbank, came out–and one unlikely bound put him on the bed. It surprised all of us. There was already a dozing Briard, Tomboy, and maybe a cat or two with all the stupid-wild danger that involves. Preacher curled up in the only space left, between my ear and the edge of the bed. That next morning, I woke up to a to a soft gargling moan. Safety required that he keep a sleepy eye on the door, so it was his feathery backside pushed up against my cheek. If you are going to sleep in a dogpile, these things happen. I used to think that Preacher Man dreamed of being an only dog. That he fantasied about the two of us on a desert island with only a couch and all the raw food he could eat. That his frantic howl-oodle-ing was an attempt to clear the room for his only child fantasy. Seen that way, all the dogs could fit the same description, not to mention a couple horses, a few old cats, and one particularly eloquent donkey. In a certain light, maybe they all wanted to be the singleton; the heir apparent. I give everyone one-on-one time but was I kidding myself? Disclaimer: I’m the human here. It’s a disadvantage. I think too much. I’m alternately wracked with self-doubt or so arrogant about our herd that I march around like a prickly yucca-goddess of the high prairie. It’s the dog’s job to rein me in and remind me of the truth. We will always be ruled by dogs. As this exhausting summer has worn on, my perspective has changed. I’m probably nuts; just write what I am about to say off as anthropomorphic hogwash. Recently all the barking and fending off of daily farm danger seems to ring with a different message. I think I’ve had it backwards. What if they see me as an only person. Their only person. What if I’m the real singleton? The little corgi men have lost a few humans in the past, as rescue dogs all know, so tag-teaming me seems the smart thing to do–in the bathroom and out in the world. To them, it’s all about herding the prize. Me. I have a big day today. I need to be alert and articulate–and I’m not sure I’m up to the task. But I slept in a dogpile of passion and persistence. They say behind every great man is a woman. Well, I’m not a great man. I’m a tired woman and my feet hurt(here), but here stand two yapping and frapping corgis. I am their singleton and they have my back. Marvel at their power! Corgis can light a city; they can yodel a prairie opera. Die hard optimists, these corgis are. And not at all fearless, but they act that way. I’ve learned it from them. May I return tonight victorious–with liver treats and beer! So fair warning to evil-doers and curmudgeons: I’m running on corgi power today. The other word for that is invincible. ← Book Talks: Grade School Revisited. You are, as always, a delight. May the Corgi Force be with you! oh my, a whole new perspective on getting out the door in the morning without stepping on eight corgi feet. they are herding me, making sure I move on to the next necessary thing. I needed that. Thank you for this post today as I end a long go of stress. We inter my father’s ashes tomorrow. I needed to be reminded of the power on four legs. Go get ’em Anna! Our condolences, Patti. Such a summer. Take care and get some dog hair on your clothes. Thank you, I plan on it! Your writing of life in the Corgi Way is spoton! I read it as my ever so alert Corgi, Thomas Dylan (I know, backwards, but my deceased parents who were ruled by him, had a certain kind of humor) guards me from possible lurking dangers from invasion of my space from the resident felines, my other house dogs and my husband. He works mightily to herd us too, but we are as willful as our Spanish goats. He is never bored. I love everything about this comment! No, life is anything but boring. What a legacy your parents left you. Heheheh! Dear Anna, This one resonated. I have an Aussie who guards me ferociously and a Golden who smothers me with Love. I am their One and Only. I had to put down my Morgan mare this week. The Texas heat finally took its toll on her condition: the heaves.Thank you for making me laugh (and cry). I appreciate your skill of writing. Alana, so sorry for the loss of your good mare. She will leave a hole in your heart for a while, but I will trust your dogs to care for you. As far as I can tell, Goldens are the very definition of unconditional love and losing a horse is a big fit of lovesickness. Take care, and again, condolences. Thank you for sharing her memory here, dear Singleton. Sounds like you might be able to use some good news. We are having a heat wave her in the Pacific Northwest as well. Our working areas are unnaturally dusting and our grasses went brown over a month ago. But with a little help from a semi retired trainer friend who flew up to see how I was doing, I had one of the best weeks in my life. He was so surprised and appreciative of the progress my mare has made and the progress of her three year old filly, he could not tell enough people. He says it is because of my heart. My girls were super of course but they have always been super. They have just been waiting for me to catch up. You have been a great help in that area. Thanks Anna. Have a great day. Ah, thanks Fred. It always makes my day to hear about you and your mares. That trainer is right to brag about you…Good for you, it is your heart.Thank you. Well, being a singleton to a pack of animals is a special position of hair and spit covered respect, and by the way, I’m married… but that’s just a silly human convention. 🙂 Thanks, and give your pack a scratch from me. Could you please share Walter’s special diet? I’d like to compare with what I’m giving my 14 year old girl. High liver numbers and skinny. She was always a little chubby until a year ago. Might be the vaccine or just aging. I also add tofu for Walter. He barely weighs 20 lbs and gets over 6 cups a day, still rail thin, also. Good Luck. Thanks! I live 30 miles from the ocean on the Olympic Peninsula of Washington State so bottom fish are easy to come by. She is a constant teaching on aging. I am working on paying attention. Yay. Good luck. Walter is so far past his expiration date that the vet and I laugh about it. She says she thinks his diet is a big part of it. Let’s hope it works for you; she clearly isn’t done with you yet. Corgi Power to you! Thanks so much, for recapping the stress and the de-stressors in our lives. What would we do without our four-legged family! I for one hope to never find out!